The book is a result of a double documentary endeavour as it were. Presenting the contemporary dancescape of India in the form of a book covers the first ambition. This obviously comprises a large number of photographs and accompanying texts by both practitioners and scholars. The second aspect goes back to an experimental project on Writing about Dance sponsored by the Swiss and German cultural institutes (Pro Helvetia and Goethe-Institut). 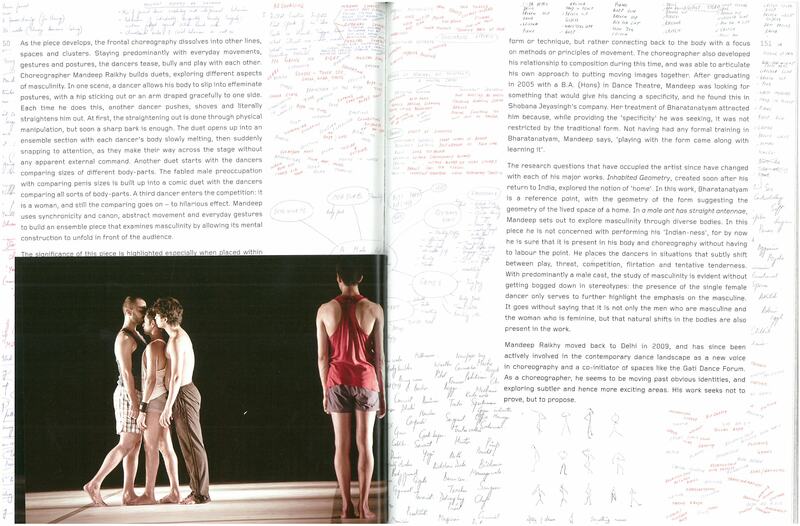 It aimed at developing forms and approaches of describing current practices and aesthetics via portraits of one selected choreographic work by one choreographer. These in-depth portraits are accompanied by inserted photographic material much smaller in size than the corpus of the book. Different colours of the paper further mark the different portions within this archival opus. 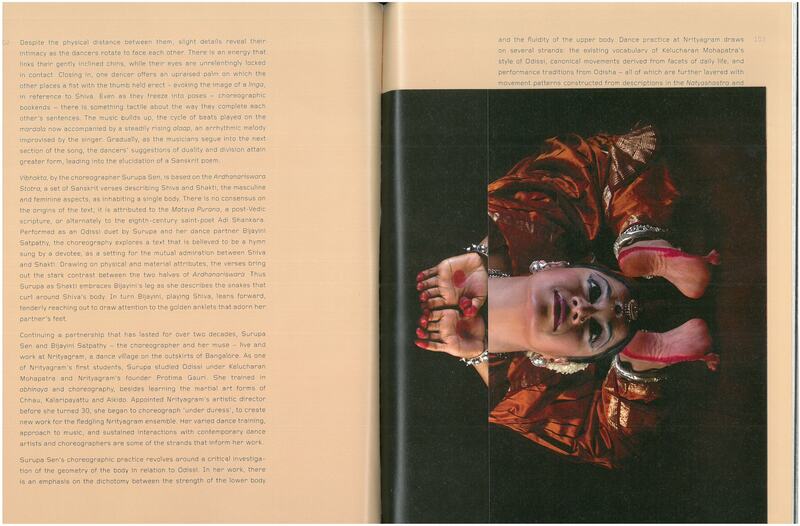 Thus a complex and sumptuous graphic layout combines various documentary levels so as to account for the broad variety of current dance making in India. 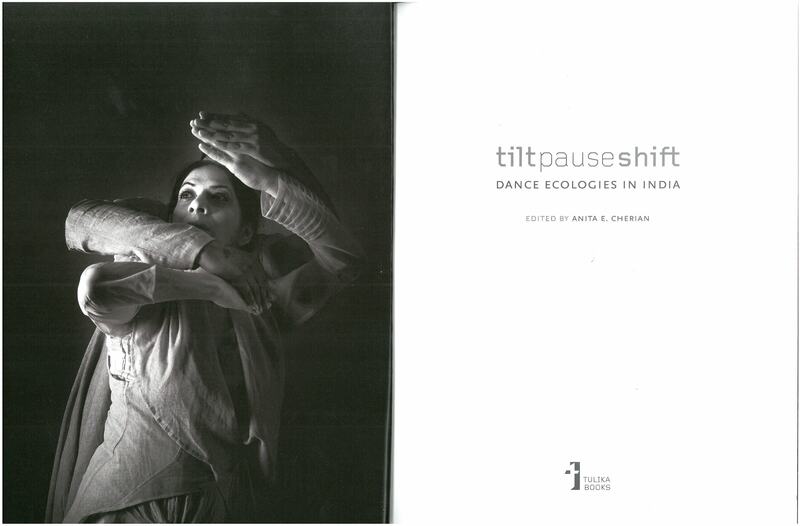 Yet as the title indicates, the scope is not only on aesthetics and style, but more on the intricate interlaces between social, political, and historic facets as well as the role tradition can play in dance appreciation. The book thus comes to serve not only as an archival insignia but at the same time collects source material apt to open up further research; it grants ›fluid access‹, to use the term informing MAP’s activities and research topic.